Happy Wednesday stylelista's! I can't believe its already Wednesday, I am soaking up the sun here in Oahu and today am taking it easy since yesterday we did a major hike up an incredible mountain with great views! I am uber excited to share today's guest post. This gal is about as sweet as sweet can be and is someone I have been lucky enough to become friends with. A Canadian girl who shares an obsession with nail polish and fashion, Haley's blog is pure addicting as she posts about everything and anything fashion. (I actually helped design her layout!) I was so excited when she jumped on board to guest post and her post is nothing short of INCREDIBLE! First of all, can we just point out the fact that Alex is in Hawaii and how jealous I am? I hope she's having a fabulous time getting some R&R on the beach! As a University student, I'm on a very strict budget. I'm constantly looking for items that can last longer than just one season and are budget friendly. I'm also not one to spend a lot on the trendy items. I've found that spending less on those has worked for me and allowed me to build my wardrobe. Below are some pieces I can't wait to wear in Spring and Summer. This TALULA dress from Aritzia is perfect for Spring paired with a leather jacket or jean jacket. Take off the jacket and it's perfect for Summer! I love the pastel color of the dress. Right on trend. I love these color-blocking ALDO's Brendle sandals. Floral is the biggest trend for Spring. Instead of buying pants, try shorts. You can easily wear tights under them until the weather gets nice enough for bare legs (which is right around the corner!). These Citizens of Humanity shorts are super cute! This clutch is a double whammy, with stripes and neon. It's no longer available on the Rebecca Minkoff website, but I'm sure it can be found somewhere else. This Rebecca Minkoff Ostrich Passport Wallet is also the perfect amount of color for Spring. Because I have thick long hair, I'll wear just about anything to get it out of my face in the warm months ahead. I loved the abstract print head wrap above from Forever 21, but unfortunately, it's no longer available. I found a great alternative, a printed feather head wrap from Forever 21 as well. Of course, no Spring/Summer wardrobe is complete with out a bright nail polish. This is my new favorite colour from Butter London called "Trout Pout". 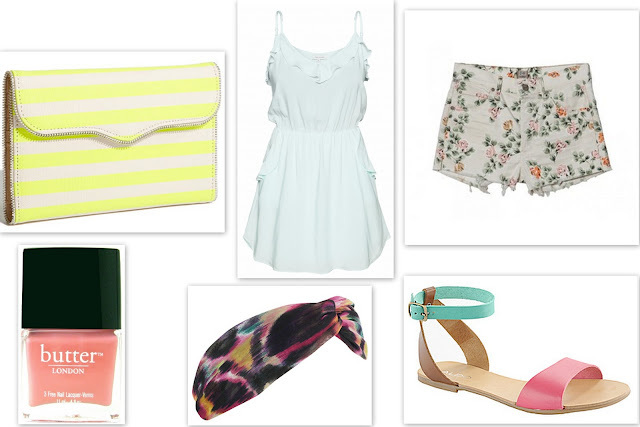 What are your must have items for Spring and Summer?